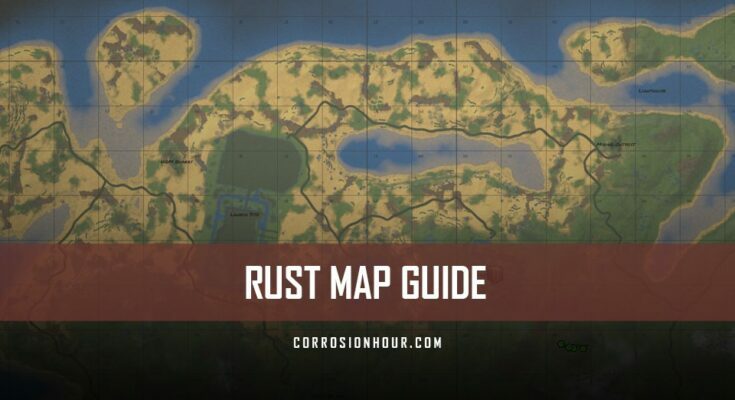 The RUST Map Guide, an introduction and detailed overview. Similar to other survival genre games, the RUST map can be massive. There are many identifying objects on the map, some that are static and others that move in real time. For new and experienced RUST players, it’s critical to learn and understand the vast landscape. With this knowledge in hand, you can begin to take advantage of the environments surroundings. RUST’s map topology will vary based on the specific server’s seed or the custom map that’s been configured. When official RUST updates are released, there’s always a chance that the procedural generation algorithm has been modified, which can cause non-custom maps to generate new topologies. It’s important for RUST players to learn how to navigate the ever-changing environment. RUST’s map is available to everyone in-game. It displays a detailed topological view of the game server. 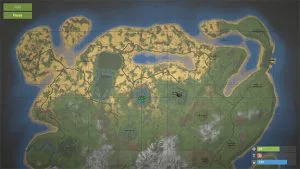 The map can be accessed by all players, at any time, while connected to a RUST game server. The map is critical for communicating specific locations, areas of interest and target destinations. It can be used in building purpose-driven strategies for a wipe cycle or developing raiding tactics. While the RUST map has many different uses, it provides players who understand it many advantages. To open the RUST map, simply press the letter G on the keyboard, while connected to a RUST server. This is the default key binding for the RUST map. The key binding can be configured through the game’s input options. When the letter G is held down, it will keep the map open and visible. 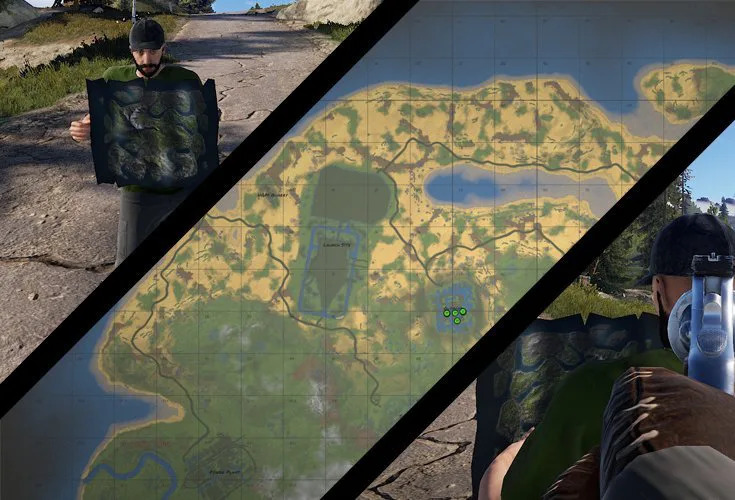 When the map is open, it will cover the character’s visibility to the world, while some areas of the interface will remain visible. Once the map is open, use the right mouse button to drag the map in the preferred direction. This will allow a player to pan their view of the map, as for most server’s the map is larger than the screen’s resolution allows. The mouse wheel button is used to zoom in or out of the map. Scrolling up will zoom the map in, while scrolling down will zoom the map out. This can be used to focus in on a specific area, allowing for a more detailed view of the focused area. To close the RUST map, simply release the letter G on the keyboard. Once it’s been released, the map will automatically close and the character’s view of the game world will be restored. In Devblog 181 the RUST map was updated to include an optional static overlay grid and coordinate system. By default, the grid is disabled but can be turned on by clicking the Grid button. Each section of the grid measures 150 meters in width by 150 meters in length. The sections are lettered along the horizontal axis and numbered along the vertical axis. These coordinates allow teams to call out more accurate locations than ever before. The focus button, also located in the top right of the map, will focus the map on to your current location. When zoomed in or panned out of view of your location, the map will re-focus so that your position is centered on the map. If you’re on an edge of the map or not already out of view, you may not notice the map re-focusing. In order to configure the default map key, navigate to RUST’s options screen. Then select the Input sub-section and scroll down to Inventory category until the option Show Map is visible. There will be two configurations available on the far right of this option row that can be selected. The first configuration is the primary key, which defaults to the letter G. The second configuration is a secondary key and is empty by default. Click on the configuration you wish to set, then press the corresponding button to be bound. On success, the selected button will be displayed for the primary or secondary configuration. The table below identifies many unique objects that are found on the RUST map. Having knowledge of these objects will help in mastering the harsh RUST environment. Boulders Boulders are represented on the map by blue dots, whether they’re individual or clustered formations. Caves Caves can be difficult to identify, but have a distinct outer-edge eclipse shape, with a dark object in the center. Chinook A Chinook CH47 military transport helicopter, piloted by hostile scientists, is represented on the map by a helicopter icon that roams between monuments. Debris Field Debris fields are represented on the map as yellow and red explosions. They remain on the map for 10 minutes after a Bradley APC, Chinook, or Patrol Helicopter has been destroyed. Ice Lake A solid lake of ice, with a reflective top and sometimes found with rock formations and/or broken down vehicles. Locked Crate A locked crate, with a computer on top that must be manually activated by a player in order for the loot inside to become available. Monument A human-made structure, often containing loot boxes and barrels. Many monuments provide considerable cover. Shop Front Shop fronts are represented by circular green and red icons. Green icons indicate that the storefront has stock available, while red icons indicate the opposite. Power Line Power lines are represented by 5 small blue dots, found in succession of one another on the map. Power Transfer Station A rusted, roofless structure with broken walls. They are often found around power lines, roadways and the edge of monuments. Roadway Roadways are represented by dark gray lines, which connect the monuments and building structures together. Rock Ledge A small raised rock ledge that is part of the map’s topology, typically found in areas where the elevation is raised from sea level. Team Members Team members will appear on the map as green dots, in real time, with the specific team member’s name displayed above. Shallow Water These areas indicate shallow water that can be passed through on foot and does not require swimming. Your Character Your character’s position on the map, indicated by the yellow dot with a caret inside. In previous versions of RUST it was required for players to craft a paper map first, then place it in their hot bar or right click on it while in the inventory to view it. The map also had a fog of war and didn’t display the entirety of the map. Players were required to explore the world while having a map in their inventory and then the map would keep a record of your travels and remove the fog of war. The first version of RUST maps allowed players to draw on them. Losing a map at this time was serious business, as maps were often great sources of intelligence. Players would add data to the map, such as base locations, worthy targets or already raided targets. RUST maps have come a long way and shifted the game’s meta into a new phase. Don’t forget, the game is still continuing around you while the map is open! It’s important to remember when the map is open that you’re vulnerable. Players and NPCs alike won’t think twice about taking advantage of a player sitting still. Make sure to take cover before opening the map and always be aware of your surroundings. When streaming RUST stream snipers will use the map’s information to deduce the server being played on. Stream snipers will also use the map’s grid information and objects to triangulate your team’s positions. Avoid using the map when streaming or consider loading up a static map on a secondary monitor.